Image: Artemisia1508/Getty Images. CSA Images/Getty Images. Design: Ashley Britton/SheKnows. Have you ever walked into your home and just felt… down? It might be an untidy space or that the air feels stale or that you can't recognize yourself in your decor — any number of things can make our homes feel like less than the safe, welcoming areas we want them to be. If you can't shake the feeling your home needs more positive energy, here are a few tips that can get the good vibrations going. 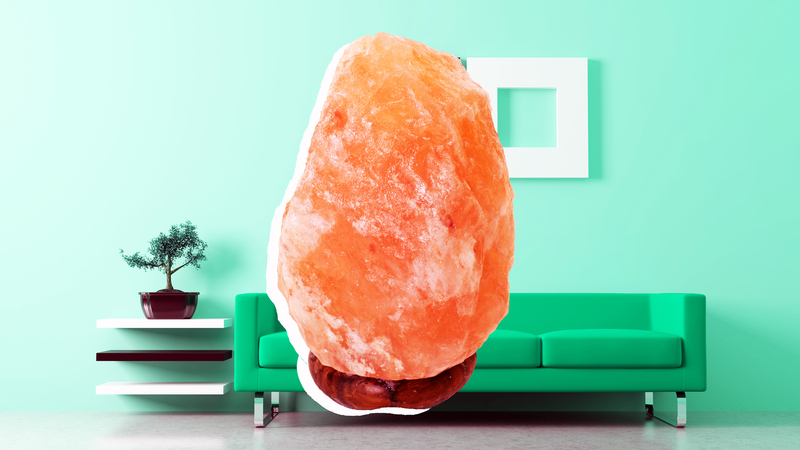 Proponents of salt lamps say they produce positive ions, improve air quality and possibly improve allergies. These claims haven't been substantiated by science, but whether you buy into that or not, they inarguably do add a soft, warm light to a room that tends to make a room feel more cozy and peaceful. They’re best in spaces where you spend time in the evening, like the living room or bedroom. Bringing more positive energy to your home means engaging more of your senses. We live a lot of life in our heads, following our thoughts as they jump around. An easy way to reengage in the present moment is to focus on bringing your physical senses into play — and some scents even have research to back up their power. Lavender seems to help calm anxiety, as does jasmine, and peppermint seems to have an energizing effect. Put a few drops in a diffuser in a central area in your home or wherever you spend the most time. One technique that seems to help people feel more calm and present is grounding, or getting a sense of your physical self in the world, and being close to the Earth can help you do that. A simple way to feel more grounded is to have an area in your home where seating is on the floor, like a meditation cushion or a few blankets stacked on the ground. The change in location also helps you see your home from a new perspective. Place a few seats around a coffee table or find a corner in your bedroom or spare room where you can see yourself going when you need to center yourself. Houseplants remove chemicals and add oxygen to the air, which is definitely some positive energy, but they also seem to reduce physical and mental stress. Most of the benefits seem to come from leafy green tropical plants, so consider easy-to-care-for options like pothos, spider plants and ivy. Add a splash of green to every room in your house. Art isn’t just about filling a blank wall — it can actually increase blood flow to the brain and be as powerful as falling in love according to 2011 research at University College of London. Take time finding art that makes you feel good. Try to match the art’s mood to the energy you’d like to create in your home, like peaceful art for the bedroom and energetic art for communal spaces. While clutter can add negativity, you can add good vibes to your home by purposefully putting meaningful objects in areas where you need a heartfelt reminder. Don't be afraid to take sentimental items out of the closet and display them. Maybe it’s a picture of someone who loves you near the mirror where you get ready in the morning, a small trinket from a place you felt happy and content on your bedside table or a set of tarot cards that help you get to know yourself a little better. Making meaningful objects part of your decor helps make it feel safe, which can add to the positive vibes.